In its Communication “Building trust in EU-wide justice. A new dimension to European judicial training", the European Commission set the goal of ensuring that half of all legal practitioners in the EU (around 700,000) are trained in EU law or the national law of another Member State by 2020. In 2012 the European Commission carried out the first reporting on European judicial training. European Courts is an EU and ECHR law blog. Its general objective is a better understanding of EU and human rights law. This blog also aims at bridging the gap between the law in the books and the law in action. It is a platform of exchange of knowledge and experiences in the field of European law between judges, prosecutors, lawyers and legal academics. The European Patent Office offers a limited number of internship places for national judges of the EPC contracting states at the EPO Boards of Appeal. The programme is organised by the European Patent Academy, whose objectives include the promotion of equal access to training opportunities related to international and European patent law and practice in all current and future EPC contracting states, and the Boards of Appeal. On November 9th during the General Meeting of Judges 11 new members of the Judicial Council were elected. In accordance with the recently amended Law on Courts the number of members of the Judicial Council increased from 21 to 23. For the composition read more. 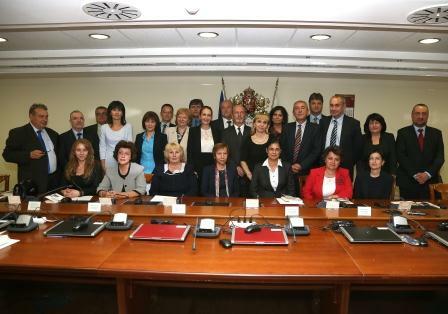 The new Bulgarian Supreme Judicial Council (picture) met for the first time on 3 October 2012. Ms Sonya Naidenova, formerly a judge in Sofia City Court, and elected by Parliament, was elected the Council’s representative and primary spokesperson. The 22 members are elected by their peers (11) or appointend by the National Assembly (11 from judges, prosecutors, law professors etc). The Belgian High Council for Justice/ Hoge Raad voor de Justitie/ Conseil Supérieur de la Justice in collaboration with the Advisory Council for Magistrates very recently published “Guidelines for Magistrates; principles, values and qualities”. The guidelines are inspired by and based on the ENCJ Judicial Ethics report. All Belgian Magistrates have been sent a hardcopy of the booklet. At the General Assembly in Dublin vice-president of the European Commission Vivian Reding delivered a speech by video-message (link to video-message.) She expressed a strong interest in the work done by ENCJ. In a letter received after the General Assembly she repeated that she was impressed by both the volume and quality of the reports and recommendations adopted in Dublin. During its General Assembly meeting in Dublin from 9-11 May 2012 the ENCJ held elections for the Presideny and the Steering Committee. Paul Gilligan, member of the board of the Courts Service of Ireland will be the ENCJ President from 1 January 2013 till 31 December 2014. Miguel Carmona Ruano of the Spanish Consejo General del Poder Judicial will continue to be the ENCJ President till 31 december 2012.